56 • June 2018 • S I G N & D I G I T A L G R A P H I C S WRAPS DIGITAL GRAPHICS Wrap Lamination Enhancing your wraps Charity Jackson is co-owner of Visual Horizons Custom Signs based in Modesto, California. She has been in business since 1995, and has worked in the sign industry for over 25 years. You can visit her website at www.vhsigns.com. B Y C H A R I T Y J A C K S O N Let's Talk Shop talking with 3M we decided to switch to 3M Envision 8548 high gloss laminate. It's highly conformable, stretches to 150 percent and offers better scratch resistance during installation. Always match up your vinyl film and your laminate. This means use the same manufacturer for both your wrap vinyl and laminate. Also, use a premium, cast laminate on cast vinyl and a calendared laminate on a calendared vinyl film for short- term wraps. Sheen One consideration in choosing a laminate for your wrap jobs is the sheen of the film. On most of our wraps we use a high- gloss laminate, but occasionally we get requests for a laminate with a luster or matte finish. Popular choices are 3M's 8518 gloss laminate, 8519 luster laminate and 8520 matte finish laminate. Each offers great con- formability and durability. If you're a fan of Avery Dennison's Supercast films be sure to check out their paired laminates. DOL 1060z is their gloss laminate option, while 1080z offers a matte finish. L aminating your graphics is one of the most important steps in the wrap process. There are myriad options in laminate films that offer protection and different finishes. Protection Protecting your graphics is an important function of the wrap laminate you choose. 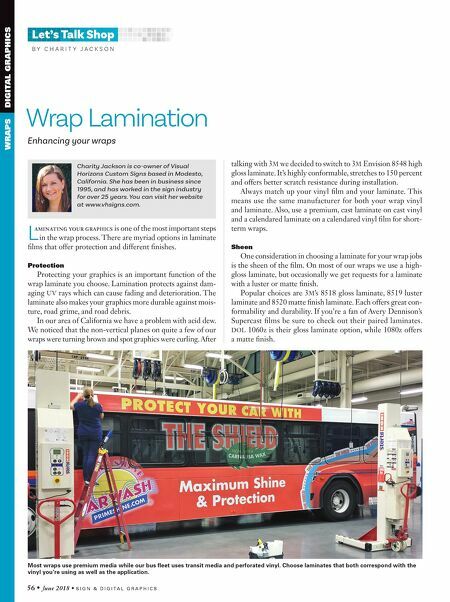 Lamination protects against dam- aging UV rays which can cause fading and deterioration. 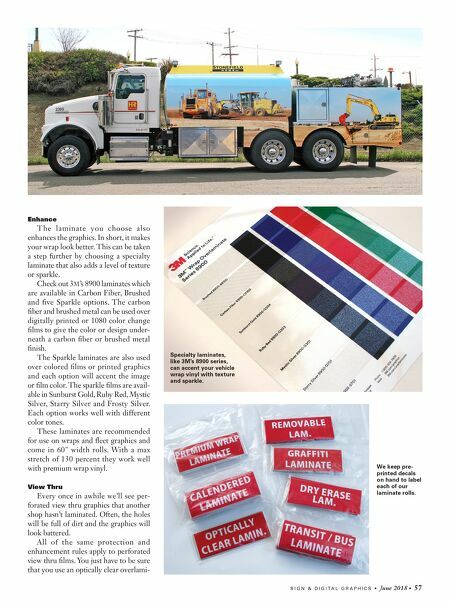 The laminate also makes your graphics more durable against mois- ture, road grime, and road debris. In our area of California we have a problem with acid dew. We noticed that the non-vertical planes on quite a few of our wraps were turning brown and spot graphics were curling. After Most wraps use premium media while our bus fleet uses transit media and perforated vinyl. Choose laminates that both correspond with the vinyl you're using as well as the application.